10 Years, 10 cars and a mental track weapon. We experience all this in 1 day! Racing cars have been a fascination for all auto enthusiasts on the planet. Being exposed to the elements which are usually hidden away behind fancy materials, the unadulterated sound of the engine and the sharpness of the steering wheel almost takes you in a trance on the track. But sadly, this feeling is reserved for an exclusive club in this world called racing drivers. What if you and I want this feeling? Where do we go? Helping youngsters realise this dream in India for the past 10 years has been Volkswagen Motorsports. And while it is a costly love affair, names like Sailesh Bolisetti and Oshan Kothadiya, who went on to race aboard in the VW Scirocco-R Cup, give us the confidence that this indeed is the right step. As a celebration for these hard-working years, the team has treated themselves to a bonkers rear-wheel-drive track experiment. And guess what? We got a chance to experience all the 10 race cars they have used in these 10 years, in both tarmac and rallying. In the briefing by Mr Rayomand Banajee, who knows a thing or two about racing, we were told that each of the cars handle differently. We were advised to always brake in a straight line before the corner to keep pointing in the same direction after it. With these keywords imprinted in my memory, we approached the cars. From the outside, these cars don't look intimidating. Sure, they wear exciting liveries, have tyres with no treads hugging the arches and sound like the angry uncle who did not return your cricket ball once it landed in his yard. But these are just cars, right? And I have been driving them for 8 years now -- how different can it really be? I was about to find out. The first car prepared for me was the 2010 Polo R Cup car, which started Volkswagen Motorsport’s journey in India. This car is special for another reason as well: it had a diesel heart and a reputation for being notorious in the corners. I put on my helmet and opened the door, only to be greeted by a bucket seat and a roll cage. This setup forced me to bend my body in ways I had not done in a long time, just to get in. It's only after squeezing through it that I realized how raw the car was. All ‘amenities’ have been sacrificed in favour of weight loss and the only body panels remaining on the Polo was the upper part of the dashboard, which served as a housing for the basic controls and power windows. As I was familiarising myself with the car, a bloke came in and strapped me in the 5-point harness, glueing me to the seat. Time then, to get going. Now, we all know race cars are loud, but that sound does not do justice to the atmosphere inside the cabin. The diesel motor comes alive with all the sensations and vibration being directly felt by you from every contact point. Every power stroke of the 4 pistons can be heard clearly inside as there is hardly any insulation between the motor and you. Race car clutches can be tricky. They have very little travel and the motor makes too much power and idles at a much higher RPM. Naturally, I stalled twice inside the pits. After being laughed at by our cameraman, I finally managed to get the Polo going. Going out of the pitlane, I realize this engine is like no other diesel I have driven before. It revs quicker than most petrol road cars and there is no conventional turbo lag throughout the range. I buried my foot down and the engine came alive with a loud whine, putting the 130PS of max power and 250Nm down on the tarmac. The car accelerated hard and in no time i was close to the corner. Having set Rayo’s briefing in my head, I braked hard, a little too much, and turned the steering wheel in. The directness of the connection just made the car change direction instantly. This gave me some confidence in the next corner as I went on the brakes later, and still the car managed to turn in without any fuss. Now, it was clear (if it ever wasn't) that the car had more racing potential than I did. So in the next corner, the Pathan blood inside me made me go overboard and brake a little too late, which carried into the corner. My senses soon realised that though the steering was turned and the tyres were making a lot of noise, the car was still heading straight. Trying to sit calm, I started to release the brakes and made corrections to get out of this massive understeer, which luckily worked. But now I had some idea where the limits of the car were, and it was time to have fun. I started pushing the car harder into corners, getting on the power early and enjoying the sequel of the tyres and whine of the engine. The TDI race car was a 6-speed manual but there was very little telling which gear was slotted in until you lift off the clutch and find out. Hard braking too resulted in wheel lock at times as the car did not have ABS. No wonder it was suited only for professional race car drivers. The lap was over too soon and we headed for the pits again. Time now to hop into the car that replaced the diesel in 2012. The 1.4-litre TSI looked the same as the TDI. But in a bit to make it easier to drive for rookie drivers, it was given electronic aids. It had ABS, hence more controlled braking, and a DSG gearbox with paddle shifters so the driver would not have to take his hands off the steering wheel. I was expecting the petrol engine to be more powerful and punchier as it was both turbocharged and supercharged, making 180PS of max power and 250Nm of peak torque, but that wasn't the case. In fact, as I got going, the petrol engine’s power delivery felt a lot more linear, unlike the diesel’s sense of urgency in the mid-range. Also, because this engine was lighter than the 1.6-litre diesel, the handling was a lot sharper and immediate. This made the TSI Polo a lot easier to go faster than the TDI. The idea was also to make the car closer to the setup used in international championships, so that a move from this to a higher class would not be as difficult. And while this car was still understeer-happy, it lets you get the power down early and more aggressively, brake later and still remain in control. Next up, I was driving the Ameo Cup car. This is the first race car which VolkswagenMotorsports has wholly developed in India and is currently running in the Ameo Cup one-make series. It gets all the bells and whistles of their current racing technology including a powerful 1.8-litre turbocharged motor from the Polo GTI with a new ECU and a 6-speed sequential gearbox with paddle shifters. The tune used here was making 205PS of power along with 320Nm of peak torque. From the moment you depress the ignition button, you know it’s an animal. After stalling twice again, I managed to get it out of the pit lane. By now, I had a fair idea of the track and what the other cars could do. The Ameo, however, was unlike any of the ones I had driven before. It was stiffer, the engine was more responsive and the car itself was bloody fast! Even in terms of handling, the Ameo was the sharpest and even the slightest movement on the steering wheels resulted in the nose pointing in a different direction. And yes, while it also had understeer, you could push the Ameo a lot harder into corners before the tyres even began to fight for traction. It was surprising how much potential the Ameo chassis had with the addition of some racing machinery. It was forgiving in corners while still being super fast on the straights. All of this while still remaining comfortable for newcomers. At this point, I was confident that the Ameo would be the most fun car here. I was wrong. Next up, we were going back in time. I took the seat in the 2015 Vento Cup Car. This replaced the Polo TSI and is the predecessor to the Ameo Cup Car. It was a bigger car than the Polo and had still features the exact same drivetrain. Because I was still used to the Ameo’s handling abilities, I approached the first corner at the same speed and ended up understeering off the track. From then on, I took a more cautious approach and realised that the Vento was easier to drive than both the Polos. Same power as the Polo, more weight and better grip, these features made the Vento easier to adapt to rookie drivers and levelled the playing field with the seasoned ones. But it was still far from the Ameo and it became evident from the dynamics how the Ameo Cup Car was 4.6 seconds quicker than this Vento around the circuit. While all of these cars were part of a racing series, Volkswagen also offers cars which you can buy and either join a national racing series or just use as a track day car. First in this line was the Vento TC4 race car, which has been developed keeping in mind the restriction of the Touring Car Championship of the country. While we could not get to drive it as it had to undergo some maintenance, there was something a lot more interesting waiting for us. Not restricted by any racing regulation, the Vento Track Day car is the ultimate track weapon for you track days. And while it packs the same powertrain as the Ameo Cup Car, a different ECU map helps it develop 35 more horsepower! So, with 240 horses under the hood, I set out on the Track Day car. The Vento looked like the ultimate blend of the Ameo’s power and the Vento Cup Car’s stability. But as I started to get more confident behind the wheel and began pushing my limits, the smile on my face kept on getting bigger and bigger. The Track Day Vento’s extra power and a steeper torque curve just pushed you out of a corner. There is a surge of torque which comes and hits you when you put the foot down and propelled the car. Combine this to the sharp handling and the Track Day Vento keeps on egging you to go faster until you find the limit. The satisfaction of hitting the apex at the right speed and in the right gear is something which cannot be expressed in words. What can be expressed in words, though, is overcooking a corner and facing the other way. Which I did. It feels like crap. 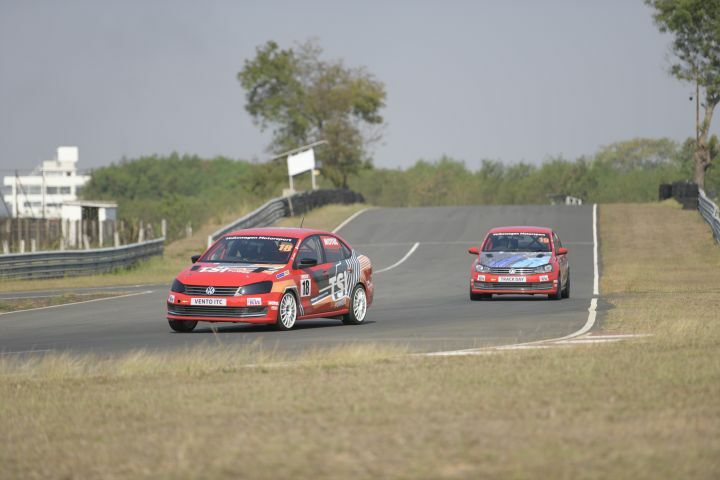 While the Ameo is still the best car here to learn racing and get the basics right, the Vento track day car is the most fun with drivers with some track experience. If tarmac isn’t your thing, then you can opt to buy any, or all of the three rally-spec Polos that VW Motorsports makes for the INRC championship. Out of the three, I decided to hop in the most extreme of the lot, the Polo R2. Powered by a 1.2-litre turbocharged petrol engine, the car packs 160PS of power and 210Nm of torque and has a 5-speed sequential gearbox with a stick shifter, just like the one Ken Block uses in his Gymkhana videos. But because this is a thoroughbred rally car, the suspension here is a lot softer. Which means on the track, it wasn't fast but was tonnes of fun, as I could slide the car in corners and still come out facing in the right direction. The stick shifter for the sequential box feels very immediate and while the DSG too is pretty quick, there absolutely is no lag in the shift of the Polo R2. Now onto the maddest car of the day, the Polo RX. Developed as the ‘Winter Project’ car, the Volkswagen Motorsport team has built a 205 horsepower, rear-engine, rear-wheel drive Polo for the ultimate adrenaline rush. The car, built in a Polo body shell, is equipped with the Ameo Cup car’s 1.8-litre TSI engine and sequential gearbox. While Volkswagen says this is still a prototype, you could order one as a track day car once they get the formula right. And because this was a prototype, we were driven around in it by a 4-time National Racing Champion and coach for the Volkswagen Motorsports Amreo Cup - Karthik Tharani. That experience you can witness when the video goes live, soon. It was an intense experience at the MMRT with these race cars. It's almost impossible to convey the feeling of speed, sound and intensity you get inside these cars through words. And with each of these cars besting the one before, this journey through VW Motorsport India's past has certainly been an exhilarating and learning one. We hope VW keeps making and improving these race cars year after year, not just because the young racing talent in India needs them, but also because we get to drive these machines year after year.